Comes with the Real Fyre G45 Triple T Burner which accentuates front ember presentation, adds depth to the flame, and maximizes warmth. One great look would certainly be enough with this set of Real Fyre Rugged Oak Gas Logs by Peterson. However, it's your lucky day. Rugged Oak gas logs have an alternative stacking feature that allows you more than one look. If you decide you'd like the flames to sprout up through the logs in a different manner, just change the configuration for a totally different style. Peterson Real Fyre gas logs are all about the perfect combination of unmatched realism, quality construction, and durability. These qualities meet in a beautiful and versatile way in the Real Fyre Rugged Oak Gas Logs by Peterson. The Real Fyre G45 Triple T Burner is a specialized gas logs burner that is similar to most high end gas log burners but adds an extra "T" shaped front burner which accentuates front ember presentation and adds depth to the flame, while maximizing warmth. With this cutting edge G45 burner, you will enjoy a more realistic looking fireplace by having an additional small row of front flames and more glowing embers. This is a vented gas log set that must be installed in a fully vented wood burning fireplace. With vented gas logs, you'll enjoy a large, realistic-looking flame that operates with an open chimney flue, or damper. These logs, which simulate a wood-burning fire, are the most realistic type of gas logs but, just like real fires, lose some of the generated heat up the chimney. 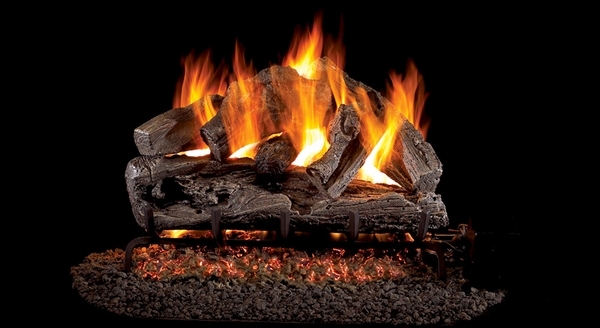 Vented gas log sets are the most popular type of gas logs sold. Professional installation is recommended. Sets include handcrafted logs, custom grate, Real-Fyre Burner System, Granules (sand or vermiculite), Glowing Embers, grate clips/log locators, pan/connector kit and damper clamp. This gas log set is a Match Light system and does not come with a pilot kit. The fire is lit using a long match or lighter while you turn on the manual gas valve either on the floor or in the wall. The flame height is then controlled by adjusting the key valve. If you do not have a valve currently, you will need to purchase either the AV-17 or the AV-18. * This is a Natural Gas Logs Set. Please verify that you have the correct gas type. * The fireplace's Middle Width must be at least 25 Inches and the Depth must be at least 14 Inches for this gas log set to fit. You can calculate the middle width of your firebox by measuring the width (left to right) approximately half way back in the firebox. If you have any questions, please contact our customer service department and we will be happy to assist you in finding the perfect size gas log set. Which Gas Logs Are the Right Size for Me? Excellent follow up from manufacturing company as the largest log arrived broken. They shipped a new one out at once.